There are nine processes of bhakti — hearing, chanting and so on. One of the processes is atma-nivedanam, submitting one’s self to the Supreme Lord. The exemplary devotee who performed this process and received benediction that even great demigods could not attain is King Bali. He is one of the twelve famed mahajanas or great devotees of the Lord, described in the Vedic literature. In the beginning of Treta yuga, King Bali ruled as the king of demons. He was the grandson of King Prahlada, who had pleased the Supreme Lord with his pure devotion at a very young age. Nevertheless, King Bali was ambitious to become the sovereign of all the three worlds. He had gained victory over the king of heaven, Indra and taken away his kingdom. King Indra and other demigods, being frustrated and shelter-less took shelter of the Supreme Personality of Godhead, Sri Krishna. They were aware that only the Supreme Lord can help them because King Bali was guided by Shukracharya, the expert spiritual master of the demons. They prayed that the Lord might conquer the demon-king and re-instate them in their kingdom. The all-merciful Supreme Lord being kind upon the pleading demigods decided to appear as the son of Aditi. When He appeared from the womb of Aditi, He was equipped with a disc, club, lotus and conchshell—the symbols of Lord Vishnu. 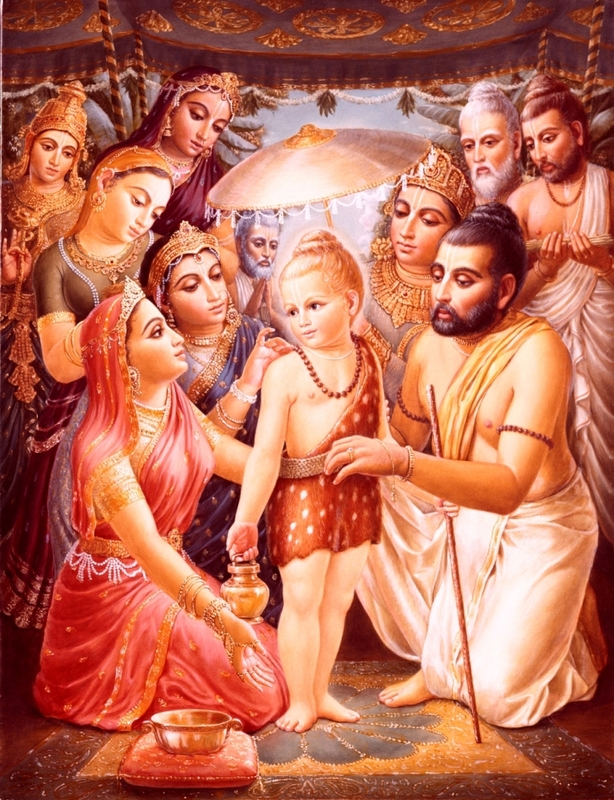 After His appearance, the Lord assumed the form of a beautiful dwarf (vamana) brahmana boy. Great sages performed rituals for the Lord’s birth ceremony, and when the Lord received the sacred thread worn by brahmanas; demigods came from all over the universe to offer Him gifts. Lord Vamanadeva’s effulgent form is beyond description. He is decorated with a shika (small tuft of hair) on the back of His head and with a tilaka on His forehead. He carries an umbrella in one hand and a kamandalu (small water container) in the other. Tucked under one of His arms is a danda or stick. He wears yellow clothes and a lion-skin or a deerskin cloth around His waist, which is often tied with an Upavita cord. He wears a pair of earrings which are significant. His third finger bears a ring made from darbha (dried grass). King Bali was determined to perform 100 ashwamedha yagnas (sacrifice), as per his spiritual master Shukracharya’s instruction. He had completed 99 sacrifices successfully. In each of the sacrifices, he had performed all the rituals, given away riches in charity to qualified brahmanas and received their blessings. Lord Vamana arrives at Bali’s sacrificial arena. Seeing the beautiful form of Lord Vamana as a brahmana boy with an umbrella and kamandalu in His hands and a beautiful captivating smile on His face, King Bali becomes happy and feels himself fortunate to receive such a brahmana. 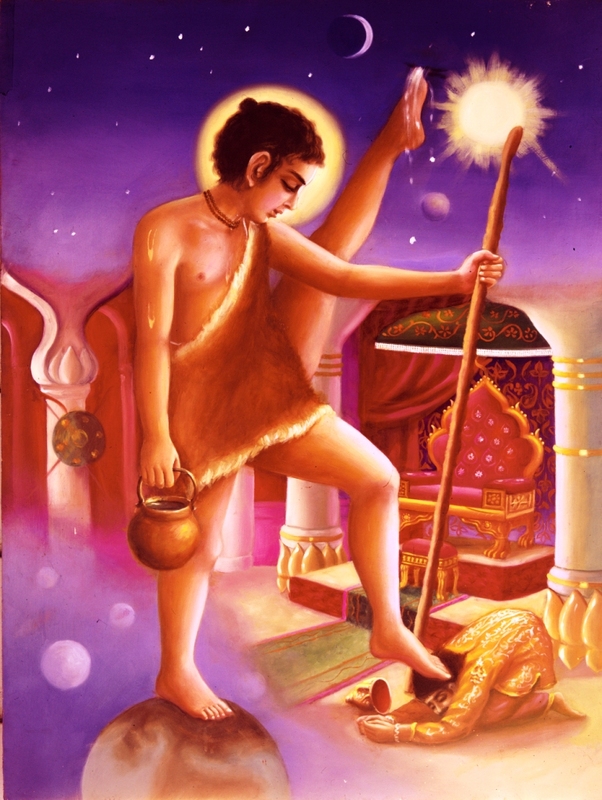 When it is Lord Vamana’s turn to receive charity, King Bali offers Him whatever riches and material wealth He would like, but Lord Vamana refuses everything and states that He would just like three paces of land measured with His own feet. King Bali finds the dwarf brahmana’s request amusingly small and is ready to grant it. 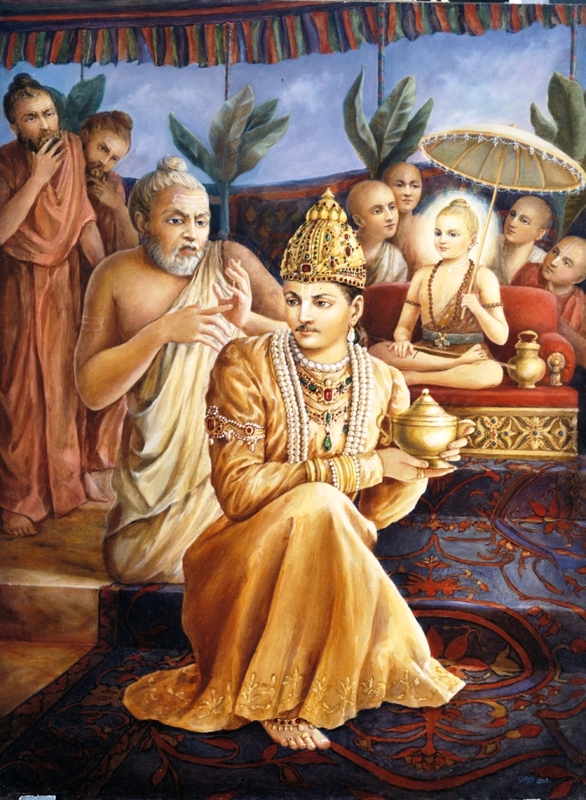 Shukracharya, the king’s spiritual master, recognized that the dwarf brahmana, being Krishna Himself, could respond by taking away everything the king had. So he urged King Bali not to grant Vamana’s request. 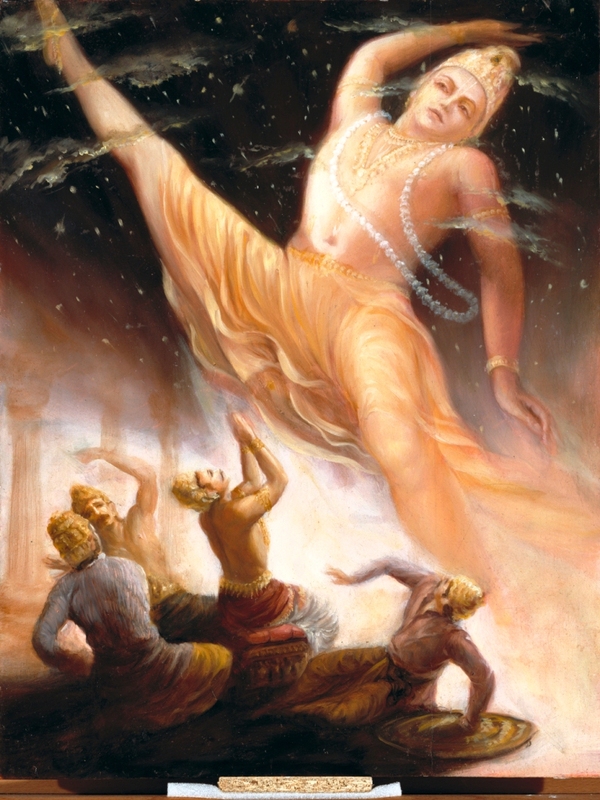 When describing this pastime, Srila Prabhupada states – “But his spiritual master, so-called spiritual master, he could understand that ’This boy is Vishnu, God Himself. He has come to cheat this Bali.’ So he asked his disciple, ’Don’t promise any charity to Him. Because He is God, He will take your everything. Once you agree to offer something, then He will take yourself also.’ God is very intelligent. Once you engage yourself in Krishna consciousness, there is no way out. You cannot go out. You cannot go out. He is so kind. As once you become sincerely a surrendered soul to Krishna, then there is no way out. You have to be Krishna conscious. You have to continue to be Krishna conscious. You cannot do otherwise.” – Lecture on Bhagavad Gita 9.26-27, December 16, 1966. But Bali Maharaja rejected even his own spiritual master and agreed to grant Lord Vamana the boon which He had asked. Srila Prabhupada explains – “So Bali Maharaja is one of the mahajanas whose footprints we have to follow. He has given tacit example. Anyone who is against God, he should be at once rejected. Never mind what he is. Yes. Never mind what he is. He should at once be rejected. This is the example of Bali Maharaja.” – Lecture on Bhagavad Gita 9.26-27, December 16, 1966. Bali realized that Shukracharya was right in identifying Vamana to be the Supreme Lord Himself. But Bali did not feel cheated or tricked, rather, he was overwhelmed with joy to be able to offer everything he had, to the Supreme Lord. Even after he was left with nothing to offer, Bali was determined to keep up his promise of charity. Without a second thought, happily with devotion, Bali offered his own head as the place for the Lord’s third footstep, thus revealing himself to be a surrendered devotee of the Lord. Lord Trivikrama put His foot on King Bali’s head. Being pleased by Bali’s complete surrender unto Him, Lord Vamana gave him in exchange the greater kingdom of Sutala-loka with all its riches. Not just that, the Lord decided to serve His great devotee and took up the post of doorkeeper at Bali’s palace in Sutala-loka. When Ravana set out to conquer the whole world, Lord Vamana defended the palace gates of King Bali in Sutala-loka. When Sage Durvasa begged Lord Vamana to leave Bali for some time and defend him against the demon Kusha, Lord Vamana refused to do so without Bali’s permission. Bali surrendered everything, his very self at the Lord’s lotus feet and served Him with atma-nivedanam. The Supreme Lord gave Himself to this great devotee and served him as a door-keeper. There is a divine competition between the Supreme Personality of Godhead Krishna and His pure devotees. It is a divine competition of glorifying one another. Devotees want to glorify their sweet Lord to the maximum capacity possible by them. The Supreme Lord wants His devotees to become more glorious by showing their exemplary qualities through His various pastimes. One who gives to Krishna is never a loser; he gets a million-fold back from Him.